Is Constantine making a comeback? According to Bleeding Cool, the short-lived NBC series may return on The CW. NBC cancelled Constantine back in 2015 after one season. The DC show starred Matt Ryan as the titular British occult detective. 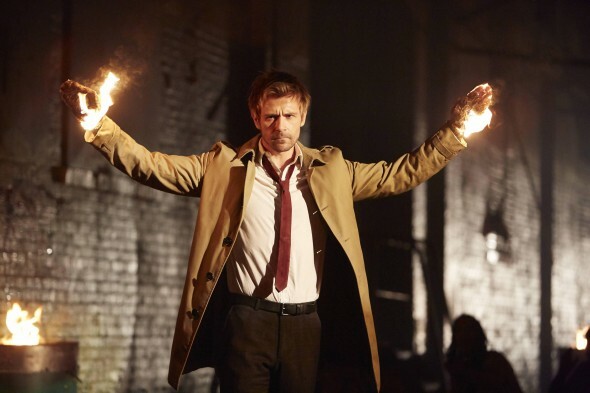 After a successful crossover with The CW’s Arrow last fall, Bleeding Cool suggests the network could order a full-fledged revival of Constantine. Additionally, the site claims that The Vampire Diaries is ending after its next season and Constantine would be a natural replacement for The CW’s horror-themed Friday night lineup. Of course, The CW has not confirmed a Constantine revival or the end of The Vampire Diaries. In fact, CW boss Mark Pedowitz has said he wants more seasons of the drama series. What do you think? Would you like to see Constantine on The CW? How many more seasons do you think Vampire Diaries will last? More about: Constantine, Constantine: canceled or renewed?, The CW TV shows: canceled or renewed?, The Vampire Diaries, The Vampire Diaries: canceled or renewed? Would pay to watch Constantine. That’s how badly I wanna see it. Love it. Freaking hate NBC! constantine turned out to be a really good show and I no over 500 people that wants to see it again and you will make a lot of money off of it so it’s a win win for everyone and to bring it on the cw would be a dream come true cuse that’s my channel I watch everything on there so it’s only natural that you add constantine to the family..
please bring back Constantine it ranks at the top with supernatural tv series!! Please bring back Constantine, it deserves a second season…and is Nina returning to the Vampire Diaries for the final season? Well one part of this rumor turned out to be true with TVD ending. I’d love to see Constantine return but if the show returns who else would be returning besides Matt Ryan. Most of the actors are on other projects and the showrunners are on other shows. That being said, given the creator of Supernatural is a Constantine fan, the pairing of Constantine and Supernatural would be quite awesome! Why cancel another series that people enjoy I’m from the UK and found Constantine on Amazon and as soon as I diminish watching the first season I searched to see when season two would be available and I couldn’t believe that tv executive had decided not to continue with it. Please consider season two I am sick of the decent shows being axed and having nothing but reality drivel on tv theses days sort it out please. NBC is kind of ridiculous that way. I think they have a higher expectation of ratings because they were a powerhouse in television with the hit comedy series 30 Rock, Parks and Rec, and the biggest one: The Office. They really didn’t have any shows as strong as that to replace them when they ended, and with viewers watching more shows online, they struggled to compete. I would say they are more old school and are the ones that aren’t adapting to the changing times. I have to say I think season 8 should be the last for tvd and bring in constantine. This would be SO perfect. I enjoyed TVD, but it’s day is over. The Originals is a better and more engaging show. Constantine fits naturally into the DCverse, so bring it back!!!! Please, Bring Constantine back, i loved the story-line built in that, and the part at the end was a huge blow to me, i would love to see it coming back again!!! Bring Constantine to the cw. It was an amazing series and bids for future crossovers. Who wouldn’t? Constantine can return on any network and ill sure as hell watch it. Just end it. It’s been dead for awhile. So many potential storylines gone because Plec and co killed off Kai and his coven. Absolutely! I would love to see Constantine on CW!! !